With 1 California Fire Contained, Survivors Find Rays Of Hope Amid The Horror Southern California's Woolsey Fire is now fully under control, while the Camp Fire up north isn't yet completely contained. Hundreds there are still missing — but survivors are trying to be thankful. 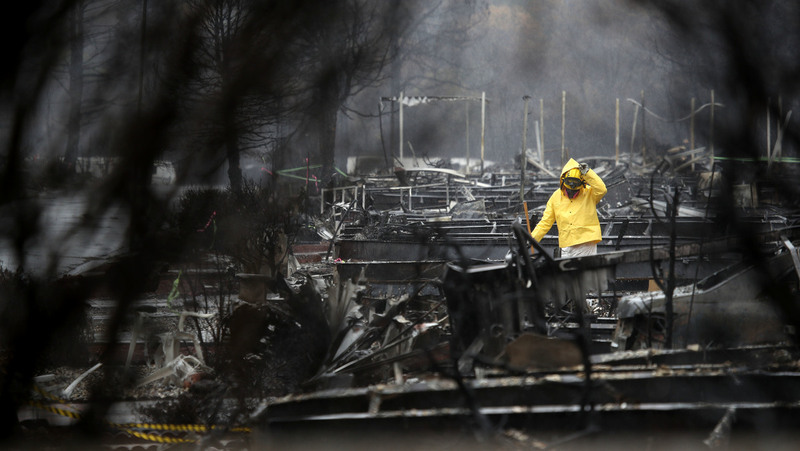 A member of a search and rescue team combs the ruins of a mobile home park Wednesday in Paradise, Calif. Hundreds of people remain missing, and survivors are struggling to cope with life after escaping the Camp Fire. On the evening before Thanksgiving, some Southern California residents got something they haven't had for awhile: a little good news. The state's Department of Forestry and Fire Protection announced that the Woolsey Fire has now been fully contained. The blaze killed at least three people and destroyed some 1,500 structures across Los Angeles and Ventura counties before firefighters managed to rein it in. Residents of Malibu and other battered areas are beginning to return home — if their homes still stand — for a bittersweet holiday. As mixed as their blessings may be, those residents find themselves in a better situation than their counterparts in Northern California, where the Camp Fire continues to rage in some areas. Hundreds are still missing. At least 84 people have been confirmed dead — and with more than 560 still unaccounted for, that death toll threatens to climb as authorities identify more victims' remains. "In my experience being a firefighter for 33 years, I have never seen such complete devastation," retired firefighter Chris Blair told WBUR's Here & Now. Blair traveled from Santa Barbara to join the hundreds of volunteers combing through the ruins of Paradise, Calif., for victims' remains. "There were numerous vehicles that were burned out, and the houses — there were few walls or anything standing above the ground," he added. "Mobile homes were nothing but a metal frame." 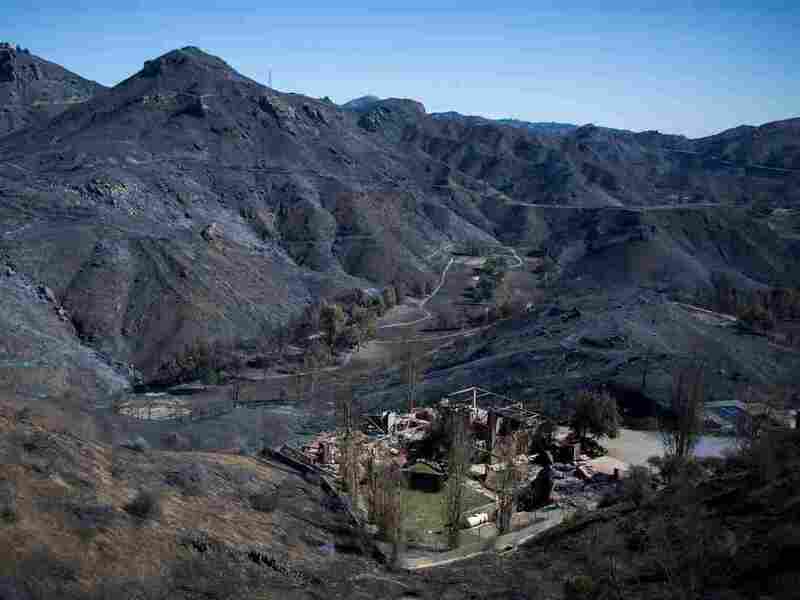 The Santa Monica Mountains, seen here last week, stand blackened and barren after the Woolsey Fire left but few patches of green behind in Malibu, Calif.
Beginning on Wednesday, rain swept through Butte County, helping firefighters bring the Camp Fire under 95 percent containment — but also complicating recovery efforts by raising the risk of mudslides in an environment singed clean of vegetation. The rain has also upped the urgency to get local evacuees to indoor shelters. In a large field next to a Walmart in the nearby town of Chico, where dozens of fire victims set up tents, a site some have dubbed "Wallywood" — a play on Walmart and Hollywood — volunteers are trying to get survivors back into dry areas. However, Andy Gummow, who has been volunteering at the site since the fire broke out, said in some cases the only available shelter is many miles away, and some evacuees in tents have balked at the offer. "Since Paradise is very close to Chico, many from Paradise have ties to Chico — be it a doctor, a pharmacy, family friends. And they don't want to be relocated so far away," Gummow said. "Not to mention, many of them lost their vehicles." Officials from the Federal Emergency Management Agency told reporters this week that one of its goals is to reduce the population of Red Cross and church shelters, which are overflowing with people. FEMA says 15,000 households around Paradise have registered for assistance. The agency has delivered more than $9 million for evacuees to stay in hotels and apartments up to a month as they figure out what's next. Walmart, meanwhile, has posted signs on the lot asking the Paradise survivors to find another place to go. Private security guards have also been patrolling the tent encampment. "Seems like a mild threat to try to scare us off," said Carroll of the moves to relocate him and others. "What's the real problem? It's an empty field and some people feel comfortable here for the time being." Butte County officials have offered free rides to a shelter or gas station gift cards to lure some away, but evacuees such as Russell Carroll worry about getting sick in shelters. It's not an irrational fear. Local officials have reported an uptick in norovirus cases stemming from the increase of people now living in the emergency shelters. The precipitation could cause an "urgent health and safety concern for those who are camping on the open field as this is a water runoff/water table area," warned a sign posted in the area, according to the Chico Enterprise-Record. Jeff Evans, a 59-year-old resident of Concow, near Paradise, never had the chance to leave his home. He told NPR's Morning Edition that while he and his elderly parents had been packing up to leave, his father stepped out of the house to take a better look at the situation. "When he came back a minute or two later, he said there's just no possible way that we are leaving to go anywhere," Evans recalls. "There's no way you're going to drive through flames like that." So, with the help of some neighbors, his family made an improvised fire line, cutting down the vegetation around the house to impede the blaze's progress. It was only hours later, when the fire's fury had subsided some, that Evans and his family realized they would come out of the crisis alive. Eventually Evans felt safe enough to take a ride up the road and look around — and there, in a cluster of abandoned cars, he said he managed to rescue others trapped in the fire. "I looked into the one of the windows of one of the vehicles, and there's two puppies in the car. So I grabbed the dogs, I put them in my truck, I went to the next vehicle — and it's like every vehicle had one or two dogs. One of them had six dogs," Evans says. "I just, I can't — I don't know. I feel so fortunate that I drove up the road at that moment, or those dogs would have died, I'm fairly confident." 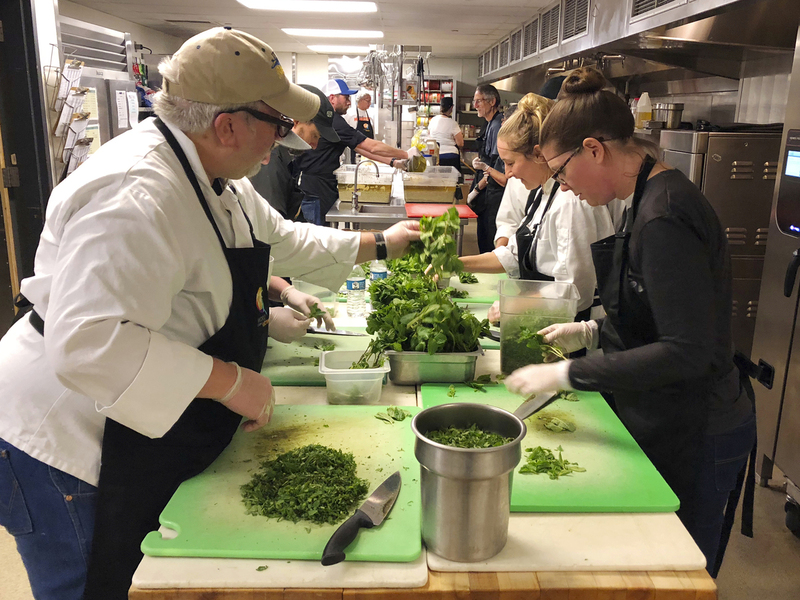 Volunteers prepare a community Thanksgiving meal for Camp Fire survivors Wednesday at California State University, Chico. Now he and his family — and all the newfound dogs — are spending Thanksgiving together in a quiet, bleak landscape, where most houses except theirs are in smoldering ruin. Evan says under the circumstances, he's thankful for what he's got. "I know Thanksgiving is a big deal, but my conditions of life have changed. And this is where I am, and that's what I have available to me," he says. "So I'm just going to keep doing what I do." Across Chico, volunteers prepared some 15,000 Thanksgiving meals to those displaced by the Camp fire. Among the people who helped feed the fire victims were the first responders to the blaze, including firefighters and other emergency crew workers. The dinners were eaten in Red Cross shelters, universities and breweries around town. "This fire has really been horrific," says Robin Gregory with Sierra Nevada Brewing Co., which is based in Chico and was one of the sites serving thousands of displaced families. "In moments like that, you really need some kind of anchor to remind you to come home, to come together as a community. There's really nothing as nourishing as coming together for a Thanksgiving meal." Inside at a table in one of the brewery's dining halls, Cherise Tamayo, a 52-year-old who works in landscaping and lived in a duplex in Paradise, was eating a meal with her daughter, Gabby. Her neighbor, Ashley Valazquez, who was with her infant son, joined them. Valazquez' house was also swallowed up by the flames. Tamayo says she remembers letting her dog out when she first saw the fire's billowing smoke. The first thing she did was rush to a nearby mobile home park for the elderly to let the residents know a massive fire was coming. "By that time, the fire was on the road," Tamayo says. With the duplex that she once called home now reduced to ash, she says the Thanksgiving dinner on Thursday reminded her that she's part of a supportive community in Northern California. "This is something that everybody here has gone through, and this just brings everyone together, the fact that they can share these experiences and vent some of the things they went through," she says. Tamayo, who was renting her duplex, said this is the third time she has become homeless because of a fire. But she has never seen a blaze quite like the one that destroyed Paradise two weeks ago. "Before it jumped the ridge, about eight miles away, you could hear it. You could hear the fire. You could see the flames. I wish there was a way to convey to people what everyone here went through," she says. "And there's just no way to do it." For now, she is staying at an R.V. park in Chico with her daughter, three grandkids, her son-in-law, three cats and a dog. She has been able to park her trailer for free, and there are free hot showers, food and other basic necessities. But Tamayo knows her family cannot stay there long-term. When she does relocate, she says she won't move back to Paradise, which is now a desolate landscape of charred debris, torched Evergreen trees and tangled power lines. Some displaced residents may decide to rebuild there, but not her. She's considering going down to Florida to stay with her parents for awhile, and then maybe move to Montana. "California," she says, "is too expensive."